Sometimes-radical redesign and reorganization of an enterprise is necessary to lower costs and increase quality of service. 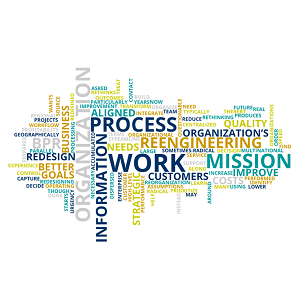 Business Process Reengineering (BPR) is the practice of rethinking and redesigning the way work is done to better support an organization’s mission and reduce costs. Reengineering starts with a high-level assessment of the organization’s mission, strategic goals, and customer needs. Basic questions are asked, such as “Does our mission need to be redefined? Are our strategic goals aligned with our mission? Who are our customers?” An organization may find that it is operating on questionable assumptions, particularly in terms of the wants and needs of its customers. Only after the organization rethinks what it should be doing, does it go on to decide how best to do it. The Accelerate Evolution team has accumulated many years of experience through in-depth exposure to BPR exercises in large multinational and regional organizations alike. Contact us to learn more about how we can help your organization transform itself to improve the here and now and be better prepared for the future.